Kids instinctively love poetry–its rhythm, its rhymes, and its playful transformation of ordinary language. And these days, such cutting-edge, youthful forms as rap, hip-hop, and slams have made poetry more relevant than ever. 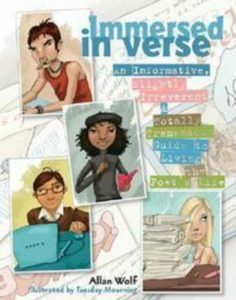 With its fun facts, exciting writing activities, and words of encouragement from a respected professional, Immersed in Verse nurtures the nascent poet in every child. Best of all, these awe-inspiring ideas have nothing in common with blah school assignments. Instead, youngsters rearrange their favorite (or least favorite) poems; start their own poetry workshop; present “open mike night” in the basement; and record their friends reciting. Along the way, they’ll open more than a few “poet’s toolboxes.” They’ll explore the wonderful world of words and learn about attitude, equipment, techniques (including “metaphors be with you”), different styles of verse, revising your writing, getting published, and performing.